Giving a Good Answer is More Than Just Being Factually Accurate! A while back, a well-known conservative Christian blog ran a series of posts entitled "Next". They were designed to be short, witty, and occasionally snarky responses to objections people raise about the church. Often the responses were well-thought out and reflected very good answers to sometimes tough questions. However, I shuddered a little every time I read them because answers that end with, "Next!" just don't seem to reflect the type of grace I'd like them to. If you know me well, you know that I'm not always the most gentle of people, but I feel like this is an area of my life that the Spirit has shaped over the years... which is perhaps why I'm more sensitive to this. Sometimes, I feel like a dating service. Seriously. People regularly want to connect them to a LIFEgroup, or they want to know when is the next event we'll have where they can connect to a LIFEgroup (an event I think would look strangely similar to a 7th grade dance). I don't hate this part of my job, but sometimes I wish it could just be simpler... less institutional... more organic. Q: Do you have any friends at Calvary? Follow-Up: Are they in a LIFEgroup? Follow-Up: Do you have any unsaved friends? Have everyone rewrite the passage in their own words. Use a whole chapter, have each person pick out their favorite verse and explain why. Ask and answer the “who, what, why, where, when” questions about the passage. Have different people try to boil the entire passage down to a 3-4 word statement. Truth we discover on our own is almost always better retained than truth which is told to us. This is not an argument against the effectiveness of a sermon (the Bible records numerous times in which the Holy Spirit worked powerfully through the preaching of a sermon), rather it is a reminder that we sometimes need to be focused on helping people discover God's truth by themselves. One of the most powerful ways to accomplish this is through asking questions. Church small groups are not designed to simply be meetings where knowledge is transferred from one person to another. They are intended to be the practical application of Jesus' command in John 13:34, a place where the one-another commands of the New Testament can be lived out. A small group should be a community of people who have committed to share their lives with one another. In the process of sharing their lives, their unity with one another accurately represents the trinity and promotes a deeper fellowship together with Jesus Christ. 1. Spending time together away from your meetings will only increase the effectiveness of your meetings. 2. Nothing says, “I’m in this with you” like providing a meal. 3. Figure out who in your group has the gift of caring, and put them in charge of your group’s care for each other! 1. Everyone’s name should be known by everyone. 2. People will usually talk about their family and their job. 3. Everybody has a soap-box, let them get on it every so often with no consequences. 4. Talking about the different places you’ve lived is a great way to tell your life story. 5. A simple way to get to know each other: Tell your favorite vacation story. 6. Some people love to talk about themselves, and others hate it. Don’t expect equal participation. Let fellowship take over the group.Study only video bible studies.Never read the Bible together.Don’t pray for each other.Don’t plan any service projects.As a leader, don’t prepare.Give advice and try to fix everyone without being asked to.Start late, finish late, and disregard everyone’s time.Don’t call your members during the week to encourage them.Don’t show up regularly. This isn't my own material. I've "borrowed" it and re-purposed it to apply to small groups. Anyone Can Lead a Small Group, Right? Of course, I do believe that every small group leader should meet a few criteria; but my basic point was that just about anyone can lead a small group if they have the right tools. I suggested four key elements which can serve as the tools to enable someone to lead a small group. These four elements are: FoodFellowshipFaithFocusWhile each of these elements is important, and a healthy group will include all of them; they are not all created equal. A proper balance of these elements will require the small group leader to spend more of his/her time focusing on some elements than on others. Most important to a group's health is the expansion of their faith. Therefore, the majority of the group's time and the group leader's preparation time should be devoted to this element of group life. Food, Fellowship, and Faith are all elements of a healthy small group. With a little bit of work and the right tools, almost anyone can implement these three elements in their group. While some may be more gifted at group leading than others, I believe that most people can lead a small group if they are simply willing to pay attention to four elements of their group life. Over the course of this week, I've unpacked these first three elements, and today I'm going to look at the fourth. Element #4 of a Healthy Group: FOCUS on the FUTURE. My assumption is that the members of a healthy small group are sharing their lives outside of their normal meeting times. A healthy small group should have "extra" events that bring them together for purposes beyond studying the Bible. These events might be meals, parties, trips, or better yet service projects, or missional activities. My opinion is that almost anyone can lead a small group (I do think there are some necessary qualifiers). This week, I've been suggesting some of the important elements of a healthy group. Having food and promoting fellowship are the first two elements of a healthy small group. Just about anyone can ensure that these elements are part of a group's life. The third element of a healthy group is Expanding Faith. Essentially, this means helping the members of your group be formed to look more like Christ. This is, in my opinion, the primary purpose for your group's existence; therefore, it should be the primary focus for the small group leader. Anyone Can Lead a Small Group, If They... Promote FELLOWSHIP! This week I've been focusing on the idea that almost anyone can lead a small group. I do think there are a few criteria that every small group leader should meet; but if someone meets those criteria, I believe they can be an effective small group leader. Part of this belief is based on the idea that "sharing life" with other Christians should be an integral part of our DNA as Christ-followers. Therefore, given the proper setting, these types of relationships should naturally flourish as long as we aren't quenching the life-giving aid of the Holy Spirit. Yesterday, I wrote that anyone can lead a small group if they have food. Today, I offer you the second element of a healthy small group, FELLOWSHIP. Anyone Can Lead a Small Group, If They... Have FOOD! 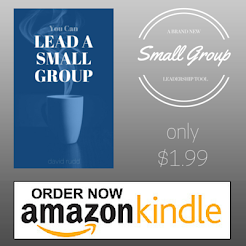 Yesterday I wrote that Almost Anyone Can Be a Small Group Leader. Of course there are some qualifications that are important (see them here), but it is true that most people can be a small group leader if they can pay attention to four elements of a healthy small group. The first element might seem a bit shallow, but it can be quite important. It's no accident that while He was on earth, some of Jesus' most important interactions with his followers happened over a meal. Something happens to us when we share food with other people. Acquaintances become friends and friends become soul-mates when people share meals. The most common activity when two people go on a date is to eat a meal together. Somehow, the presence of food helps us drop our inhibitions and open ourselves to those with whom we're sharing the meal. While these may seem like a lot of qualifications, they really aren't. I would suggest that anyone who has been a Christ-follower for a year and who has actively participated in a group of some kind should be able to fulfill these standards.